An edited version of this article was published in Flavours magazine in 2002. Text and photos © Christopher Tan. Reproduction without permission is forbidden. I had heard all about Ferran Adrià before I ever met him. I had wondered at the names bestowed on this Spanish genius by journalists-turned devotees. ‘The Salvador Dali of the kitchen’, ‘the world’s most innovative chef’, ‘a truly postmodern chef’. I had seen the photos of Adrià, wearing his chef’s jacket like a lab coat, staring Rasputin-eyed at the camera. I had read the article about Adrià and his three-Michelin-star restaurant el Bulli in Gourmet magazine  something of a seminal introduction of both to the American public  and goggled at the madness of his 25 to 30-course degustation menus. Potatoes injected with coffee syrup? Tall glasses of soup that got hotter as you drank your way down them? Courses that came with instructions as to how many bites to take? Beg pardon? I had tasted the fruits of Adrià’s research secondhand at Singapore’s Les Amis restaurant, whose executive chef Justin Quek had brought back techniques and ideas from a learning pilgrimage to el Bulli. Among them: a stew of pig’s cheek topped with an egg-and-potato foam…a seared ‘steak’ of watermelon  watermelon!  drizzled with aged balsamic (this a dish whose strangeness, I am told, Kofi Annan once sniffed at)…a strawberry jelly whose perfume of mint intensified with each successive bite. I had canvassed the opinions of two friends who had attended the same seminar given by Adrià about his food. One was “Amazing, his ideas are so interesting!” The other was unsuitable for family viewing. I had even myself gently parodied el Bulli in a column, poking bemused fun at the nostrums that it dared to call food. Who was he? An alchemist? A prophet living on the edge? The hope of haute cuisine, or its ruin? I had no idea. I finally get my chance to meet Ferran Adrià at the 2001 instalment of Tasting Australia, an extravagant biennial food festival held in Adelaide, South Australia, where he is giving a demonstration with his mentor, Juan Mari Arzak. Compactly-built, Adrià speaks softly but purposefully, and has the intense, slightly haunted gaze of a man with his mind on other worlds. For three hours, he, his brother Alberto, his creative associate Oriel Castro, and Arzak hold 200 people spellbound, with the help of their heroic translator, Eduardo Gonzales. Adrià started out in the food business by washing dishes, then worked his way up through different kitchens  including military service ones  before coming to rest in el Bulli, on the coast three hours drive from Barcelona, at the age of 22 in the early 80s. Within a few months he was head chef, and with his friend and manager Juli Soler, embarked on his journey to change cuisine forever. The world was not quick to march in step with his ideas, though, and almost a decade of obscurity followed. But slowly, chefs who were feeling their way to similar reawakenings discovered him, such as Arzak, a third-generation chef and one of the original avant-garde brigade who sought to revitalise traditional Basque dishes. They ended up spurring each other on to higher planes. 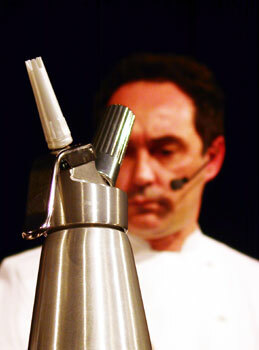 Adrià’s greatest magic is the decoupling of flavour from texture, and often appearance also. He shatters conventions with an arsenal of techniques and equipment that belong to more scientific realms: syringes, titration valves, blowtorches, things that freeze or foam up or pulverise ingredients microfine. One item, the compressed-air siphon canister, is responsible for el Bulli’s most successful export from el Bulli, espuma, or foam. With this, Adrià transforms just about any liquid into a stable, dense froth that as it disappears, releases its flavour; raspberry, Parmesan, smoked ham. Nothing that emerges from el Bulli, and el Taller, Adrià’s new ‘workshop’, is quite what it seems. A ‘couscous’ may turn out to be shaved baby sweetcorn kernels, or finely crumbled cauliflower; a saffron ‘risotto’, of beansprouts chopped into rice dimensions. A tumble of amber cellophane ‘tagliatelle’? Warm strips of consommé jelled with agar-agar, that melt in the mouth. As Adrià commentates, Alberto, who is director of el Taller, whips up gelatine-stabilised water in a mixer, slowly pouring in soy sauce. After a further 20 minutes’ relentless beating, the bowl is filled with pale brown foam. “You can dip tempura in it and it won’t get soggy,” declaims Adrià. Later, I taste it; gossamer light, it explodes into soy on the tongue. Many of his most important breakthroughs would not have been possible without two crucial ingredients, namely gelatine and agar-agar. Tiny amounts of these gelling agents stabilise liquids, enabling them to take on new textures. To a concerto of sharp intakes of breath from the audience, Alberto constructs a dessert of ’97 percent water’. On the plate is a pool of smooth, viscous ‘sauce’ of water with a little gelatine dissolved into it. Next to it is a square of jelly: the same mixture, with air beaten into it, and left to set in a mould. Under this, a crunchy white wafer: the same mixture again, spread paper-thin and deep-frozen. Completing the Bauhaus assembly, a tower of what looks like whipped cream: yes, the same mixture, foamed up with a siphon. Two ingredients, four textures, one colour. The applause is deafening. For all their technological finesse, Adrià’s methods are driven by one thing: the unceasing pursuit of purity of flavour. Even his novel textures are essentially ways of spreading flavour in the mouth. This is perhaps what distinguishes him from other chefs, the desire to utterly control and play with every single dimension of the perception of food, in the service of focussing the diner’s senses and emotions solely on the spoonful before them. Not all of Adrià’s ideas seize the imagination. For example, his description of an assemblage of tinily-cut garnishes  pine nuts, apple dice, Campari gelatine, saffron threads  as a “solid sauce” is puzzlingly oxymoronic. And some of his sweet-salty seafood combinations are surely old news to Thai cooks. But he is happy that el Bulli’s huge repertoire (the kitchen keeps logs of every dish’s creation) includes conceits that many people don’t ‘get’, because true magic (a word he uses a lot) is not the same as mass appeal. And we inhale and feel the magic. You can also read my review of the elBulli cookbook, elBulli 1982-2002, vol 3: 1998-2002, here.